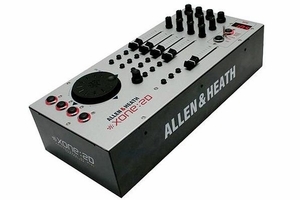 Allen & Heath have just released news of their follow-up to the Xone:3D DJ mixer, which combined analogue and MIDI mixing, along with a high quality four-channel USB soundcard in one professional unit. The 3D was out of many peoples reach, but now, the MIDI and sound card portion of the 3D is available as one unit. And it�s expected to be more affordably priced. 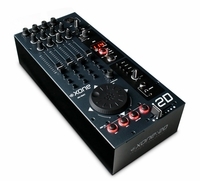 The Xone:2D takes all the MIDI controls from one side of the Xone:3D, but brings with it, the audio/Midi synchronizer and the high quality sound card, so DJs can integrate leading software such as Ableton Live and Traktor. Exisiting users and fans of the Xone:92 will be chuffed to hear that the Xone:2D sits perfectly alongside and is a kind of upgrade and there�s even a gadget to bolt the two together. The high quality USB soundcard can operate in either of two modes � stereo channels for 3 inputs from a PC and 1 return, or 2 channels from a PC and 2 returns. A large array of connections are provided to enable easy integration into any DJ set-up, and the 2D can be directly connected to turntables, CD players or linked to an external mixer. Digital IO (optical and coaxial) is also provided. The Xone:3D BPM counter with LED display is included, which is capable of detecting a beat in music presented on the stereo BPM input. A MIDI clock generator, which can be set using the illuminated tap tempo button or sync�d to the tempo detected by the BPM counter, is provided, and features the unique MIDI clock nudge facility of the 3D. The MIDI controller connects via USB to a computer and also has 5-pin DIN MIDI sockets for connection to any MIDI-enabled device, and features five 60mm linear faders, eight detented rotary pots, 19 push buttons � four of which are illuminated, five rotary encoders with push-to-switch function, and a multi-function jog wheel with switched navigation control. All the Midi controls can be mapped for use as navigation controls for DJ or production software. Compatible with any PC Software that has MIDI assignable functions: eg. Music Production, DJ , Lighting Controller, or visual effects programs.